Born Nov 29 18922,3,4,5,6,7,8 [Nov - 18939], Bute, North Union Township, Fayette County, Pennsylvania2,3,4,5,6,7,8. 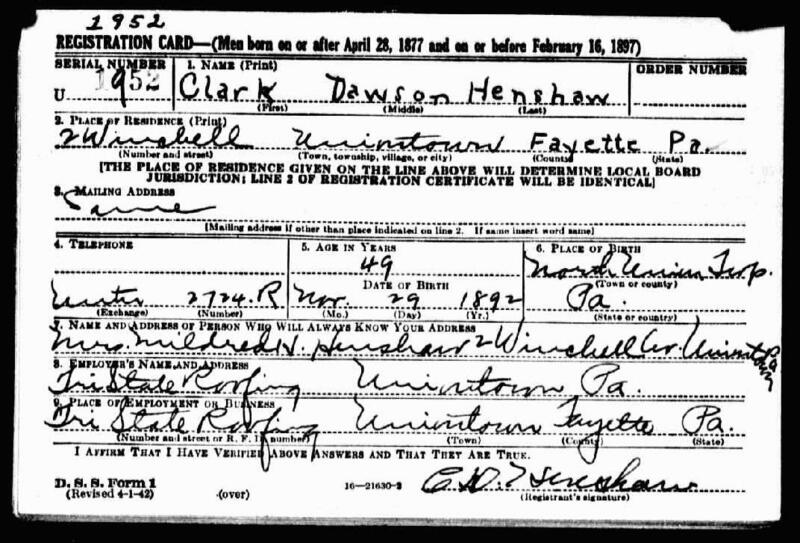 Henshaw, Clarke B., boarder, age 27, born in Pennsylvania; parents born in Pennsylvania; single; occupation: laborer, farm. 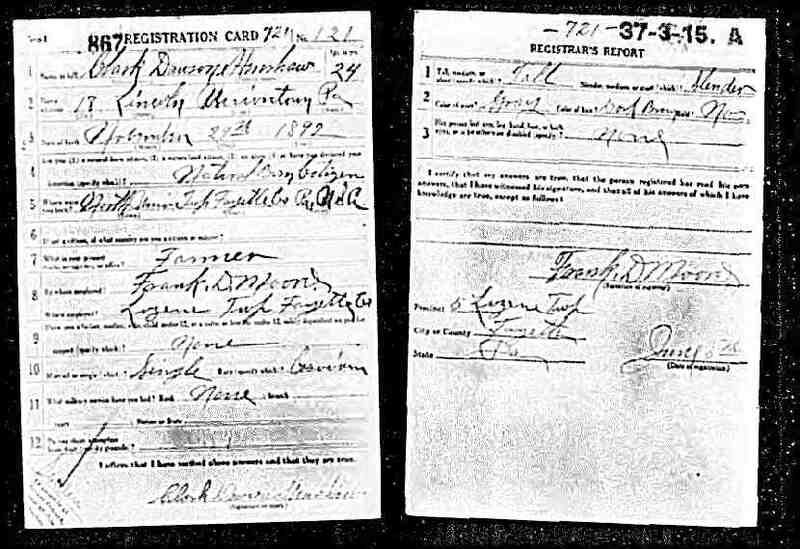 Henshaw, Clark D., head-of-household, age 37, born in Pennsylvania; parents born in Pennsylvania; first married at age 29; owned home ($10,000 value); radio in home; occupation: carpenter, house; World War I veteran. Henshaw, Mildred H., wife, age 34, born in Pennsylvania; parents born in Pennsylvania; first married at age 26; occupation: teacher, public school. Clark's obituary was published in "The Morning Herald" and "The Evening Standard" (Uniontown, Pennsylvania) on September 6-7, 19667 (see scan below). Widow Mildred's 80th birthday was noted in "The Evening Standard" (Uniontown, Pennsylvania) on Tuesday, September 7, 197611 (see scan below). Contribution from Rebecca Ann Sincevich Dearman. 1910 census, West Bethlehem Township, Washington County, Pennsylvania; roll T624-1427, ED 250, page 8A. 1920 census, Luzerne Township, Fayette County, Pennsylvania; roll T625-1569, ED 53, page 31B, line #83, dwelling #567, family #574. 1930 census, 8th Ward, Uniontown, Fayette County, Pennsylvania; roll T626-2041, ED 108, page 15B, line #67, dwelling #331, family #357. Obituary of Clark D. Henshaw; "The Morning Herald"/"The Evening Standard", Sep 6-7 1966; http://www.ancestry.com. "The Clearfield Progress", Dec 23 1918; http://www.ancestry.com. "The Evening Standard", Sep 7 1976; http://www.ancestry.com. Obituary of Clark D. Henshaw; "The Evening Standard", Sep 7 1966; http://www.ancestry.com.